LAST MAN STANDING hit a low. ABC: FRESH OFF THE BOAT was steady at 0.6, and SPEECHLESS gained 0.1 to 0.5. 20/20 rose 0.1 to 0.7. CBS: MACGYVER aired a new episode for the first time since February 22, and dropped 0.1 to 0.7. HAWAII 5-0 (0.8) and BLUE BLOODS (0.8) were each down 0.1 from last week. NBC: BLINDSPOT (0.5) and THE BLACKLIST (0.5) were steady, and DATELINE lost 0.1 to 0.5. FOX: LAST MAN STANDING fell 0.1 to 0.9, THE COOL KIDS held at 0.7, and PROVEN INNOCENT remained at 0.4. 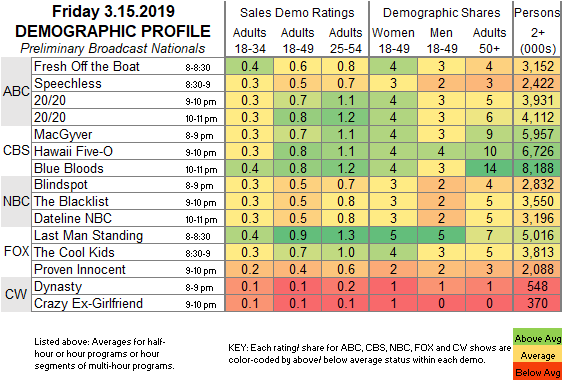 CW: The line-up returned for the first time since February 8, with DYNASTY down 0.1 to 0.1, and CRAZY EX-GIRLFRIEND steady at 0.1. CBS airs the Cirque de Soleil special ONE NIGHT FOR ONE DROP tonight. On Sunday, BILLIONS returns to Showtime, and HBO has the season finale of HIGH MAINTENANCE.